Cross-strait (Kunshan) Mid-Autumn Lantern Festival 2017 is going to be held in water town Zhouzhuang from September 20th to October 8th. Kunshan is among the most attractive destinations for Taiwanese investment and here cluster many Taiwanese companies. Since October 1990 when the first Taiwanese enterprise settled down in Kunshan, the two sides have made frequent exchanges in trade, economy and culture. In recent years, Kunshan has ramped up its efforts in constructing pilot zone to deepen cross-strait industrial cooperation, and has achieved fruitful results in industrial docking, cooperation in financial innovation, trade facilitation and civil exchanges. The festival this time is specially designed to commemorate the 30th anniversary of normalization of cross-strait relation in 1987. The festival breaks records both in level and scale. Equipped with over 120 lantern groups, the activity space is divided into four areas with distinct themes, namely Kunshan Impression, Island Charm, Zhouzhuang Story, and Praying for China. The Kunshan Impression area, themed on Blooming Flowers and Full Moon, features ecology, happiness, vitality and culture. It also comprises traditional Chinese elements like bright moon, white rabbit, painted fan and stone bridges. The Island Charm area mainly demonstrates folk culture of Taiwanese. 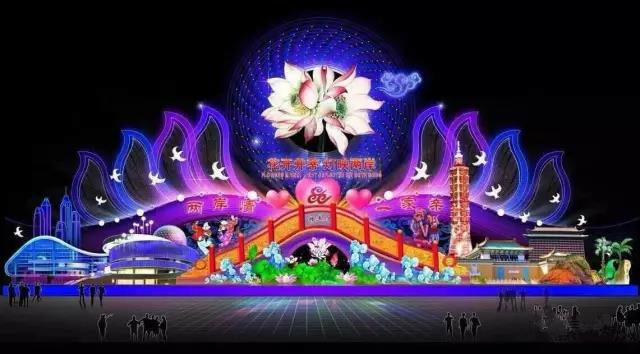 Its main lantern called Lotus Dome (lian qiong), is originated from Kunshan’s unique twin lotus, symbolizing that the moon shines cross straits. The Zhouzhuang Story area with features of Jiangnan ancient water town, displays Kunshan’s profound culture and history through cruising decorated boats and Eight Scenic Spots and Eight Customs. In Praying for China area, there is a large-scale lantern group in the shape of Map of China. The festival is also celebrated with an evening gala that marks the exchange and integration between mainland China and Taiwan. The evening gala is classified into five chapters based on five critical junctures in the past thirty years. It also illustrates a renewed look of both sides after integrated development. Apart from the glittering lantern shows, there are also a series of activities, including cultural performance, lantern riddles, and calligraphy display, etc. The lantern will be lit from 18:00-22:00 each day. And the activity charges 50 yuan per person from Monday to Thursday, and 80 yuan per person on Friday, Saturday, and from 1st to 8th in October.